If you need the best beach wedding music for your reception or you need an out-of-the-box live band for the ultimate corporate event, then look no further than RythmTrail. Playing the best calypso, reggae, soca and steel drum music for over 20 years, RythmTrail is just a click or phone call away and at a price you can afford. RythmTrail steel drum band will give your event, gathering or party the rocking Caribbean sounds of a complete steel drum band or we will play a simple solo performance that will suit your party’s tastes or budget perfectly. Comprised of talented native Caribbean islanders, we ensure your events musical needs will be well met by some of the top Steel Drum Players in the world. RythmTrail offers not only the best beach weddings in Sarasota Florida, but we also play areas all over the state of Florida, nationwide and even internationally, so you can be sure you’re going to get the top ceremony music for your special day whenever and wherever you need it most. We’ll even play your own personalized playlist of music and favorite songs, or let RythmTrail do the work for you and enhance your party with romantic, upbeat or even dramatic music that suits whatever theme you require. So what are you waiting for? Call RythmTrail today at 866-495-4522 or get a free quote online and make your next event, party or gathering an unforgettable tropical island getaway. And more, request a quote on the quotation or contact page. Thank you for your professionalism and great music pre, during and post wedding! Our guests loved the beachy and tropical vibe and we couldn’t have been happier! Thanks for making our dreams a reality! RythmTrail (Ephraim) was the perfect selection for our Tropics themed wedding rehearsal dinner planned at the Hyatt Regency Sarasota. He came early for set-up, the music selection was perfect as well as the volume, since we were in a ballroom, we didn’t want to overpower our guests. He was also very flexible and when asked to stay and play for an additional 30 minutes, he said “absolutely, no problem”. As a planner of over 13 years, I would definitely recommend RythmTrail to all of my clients. Talented, Affordable, Professional. Our steel drum player was wonderful. He was friendly and fun. It brought a lot of people into the store. Many of our customers thanked him and said how wonderful he was. We would love to use him again for another event in the future. We are jammin at Lilly Pulitzer Store today Nov 26 2016 in St Armands Circle Park, Sarasota FL. form 3-6 PM. Nothing like live steel drum music while you shop. Our solo steel drum player will be jammin sweet steel drum Christmas music tonight for a Christmas Party in Sarasota Florida. We are jammin at Lilly Pulitzer Store today in St Armands Circle Park, Sarasota FL form 3-6 PM. Shop to sweet steel drum music the sounds of the Caribbean Islands. Also live steel drum music at The Mall at University Town Center store in Sarasota Florida from 2-5 PM today. Playing for a wedding cocktail hour reception in Sarasota FL today at New College of Florida. Book the best steel drum band in Sarasota. Apr 9 2016, our steel drum players will be jammin at a beach wedding ceremony & cocktail hour reception tonight in Nokomis FL. 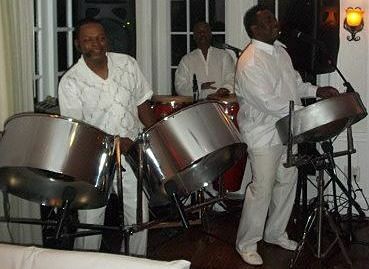 Book the best steel drum music for your wedding. Our steel drum players will be jammin for Lilly Pulitzer today Mar 26 2016 at the Sarasota FL store on John Ringling Blvd. Come by and shop to the sweet sounds of the Caribbean Islands. Our steel drum band will be jamming at restaurant event in Saraasota FL on Jan 1 2016 Hire the best steel drum players for parties, beach wedding, anniversary event, wedding reception, rehearsal dinner, Religious Celebration, Resort Event, Restaurant Event, Retirement Party, Reunion and more. We perform at any event countrywide.